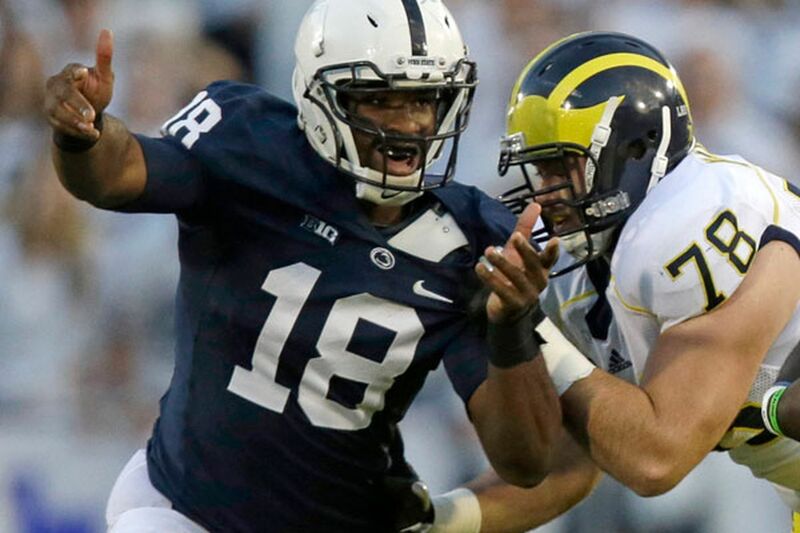 Deion Barnes (18), shown here playing for Penn State, is hoping for another shot in the NFL. For its fans, the lack of football between the Super Bowl and the April 27 NFL draft can create a boring three months. Now, a new league has not only created more football during that lull but given another shot to players looking to make it to the NFL. Former Northeast High School and Penn State defensive lineman Deion Barnes will be a member of the San Antonio Commanders, one of the eight teams in the upstart Alliance of American Football (AAF) league that is set to run from Feb. 9 through April 27. The AAF is led by several former NFL notables, including Pro Football Hall of Fame executive Bill Polian, and former Pittsburgh Steelers Troy Polamalu and Hines Ward. The other teams will be based in Arizona, Atlanta, Birmingham, Memphis, Orlando, Salt Lake and San Diego. The 2012 Big Ten freshman of the year, Barnes finished his college career with 14 sacks and 98 total tackles and declared for the 2015 NFL draft after his junior year. But Barnes went undrafted and spent the 2015 season on the New York Jets’ practice squad. Barnes, who stands at 6-foot-4 and weighs 260 pounds, returned to Northeast as a volunteer assistant coach in 2017 after being released by the Jets and Kansas City Chiefs in 2016. He reached out to his agent last May and said he was ready to play again and was introduced to the AAF. “He told me how much they were paying and the opportunities they were giving. I’m like ‘Yeah, you can sign me up for that,’ ” said Barnes. What the AAF offers is a three-year contract worth $250,000 for every player, with an option to leave the league after each season if the player is given an NFL contract. The games will be broadcast on CBS, NFL Network, TNT and B/R Live. San Antonio defensive line coach and special teams coordinator Jeff McInerney said he sees Barnes as a key contributor to the team as its season begins on Feb. 9. Barnes’ trainer since his teenage years, Greg Garrett, who trains high school, college and pro athletes at his King of Prussia facility, Level 40, said that Barnes was going to dominate AAF offenses with the skills he learned coaching the high school players. “It’s scary to me. This is not going to be fair,” said Garrett. “When you’re teaching these moves, not only are you teaching, you’re actually learning yourself”. As he prepares for this second chance at the NFL, Barnes' mindset has matured along with his skill set.